From Acts 16 forward, Luke’s account focuses exclusively on the ministry of Paul, giving no more information about the activities of other Apostles. 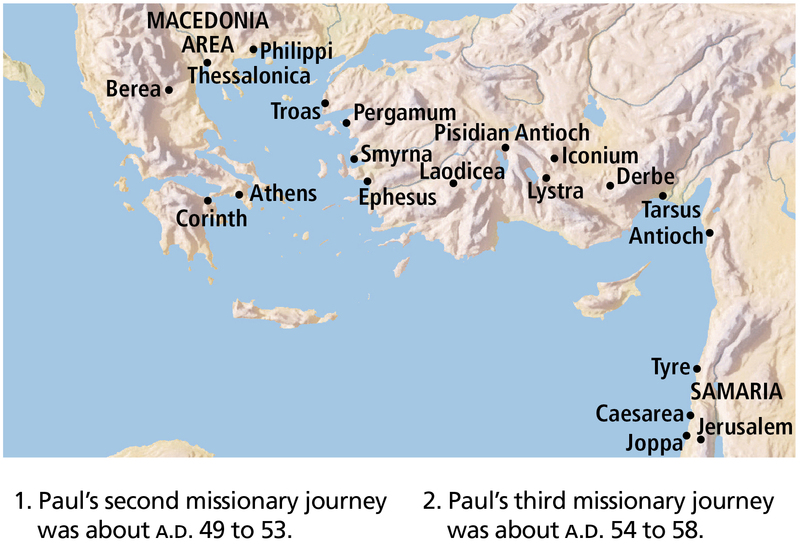 Acts 16–20 contains a record of Paul’s second and third missions. Being led by the Spirit, Paul journeyed for the first time into what we know today as Europe, where he found many individuals prepared to accept the gospel of Jesus Christ. He established churches in Philippi, Thessalonica, Berea, and Corinth. Of particular prominence in these chapters is Paul’s sermon on Mars Hill in Athens (see Acts 17). There Paul taught gospel truths that stood in contrast to the philosophies prevalent in Athens. In Ephesus, local merchants and worshippers of the goddess Diana, threatened by Paul’s successful labors, created a citywide uproar against him (see Acts 19; 20:1). As Paul left Asia for Jerusalem near the completion of his third mission, he warned Ephesian Church leaders about impending dangers and apostasy (see Acts 20:29–30). Paul’s second missionary journey is recorded in Acts 15:36–18:22. Paul departed on this mission with several purposes in mind: to watch over and strengthen the branches of the Church he and others established earlier (see Acts 15:36), to bring the Saints word of the decision of the Jerusalem conference (see Acts 16:4), and to begin a collection of donations for the poor in Jerusalem (see Romans 15:25–26). In Antioch, Paul chose Silas as his missionary companion (see Acts 15:40), and the two men went to Lystra. There Paul met Timothy, who joined Paul and Silas on their mission (see Acts 16:1–3). Timothy became one of Paul’s most trusted assistants. As described in these verses, in what way was the Holy Ghost prompting Paul and Timothy? How has the Holy Ghost prompted you or someone you know in similar ways? Acts 16:1–3. Why Did Paul Circumcise Timothy? Even though Gentile converts were not required to be circumcised or to observe other rituals of the law of Moses to be saved, Paul circumcised Timothy prior to their missionary labors together “because of the Jews which were in those quarters” (Acts 16:3; see also the commentaries for Acts 15:1, 5, 24 and for Acts 15:22–28). After being circumcised, Timothy could labor more effectively among the Jews, who would feel that an uncircumcised missionary lacked respect for the God of Israel and His laws. Effective missionaries may alter behavior in some ways to avoid giving offense to those living in their fields of labor. In making these changes to accommodate others’ feelings, the missionaries would not disobey any gospel principles. For the sake of the gospel, at times Paul himself modified his behavior to reach both Jews and Gentiles (see Acts 21:20–26; 1 Corinthians 9:20–22). He also taught Gentile converts to willingly refrain from any behavior that might be perceived as offensive to the Jews, even though it may not have been prohibited by any commandment (see Romans 14:13–15; 1 Corinthians 8:9–13). Paul, Silas, and Timothy traveled to various branches, strengthening the Saints in their faith (see Acts 16:4–5). The Spirit forbade them from preaching the gospel in Asia at that time, so they journeyed to Troas, which was located on the western coast of Asia (modern Turkey). This 500-mile (800-kilometer) journey would have taken the missionaries about six weeks to travel on foot (see Acts 16:6–8). From Troas, the missionaries crossed for the first time into Europe and began ministering in areas of present-day Greece (see the map accompanying the commentary for Acts 16:1–2). In Acts 16:6–10, we see the Lord directing His servants to where they were needed. This journey into Europe was a turning point in the preaching of the gospel to the Gentiles, for the missionaries were soon able to preach with power among people who listened to them. Modern Apostles have had similar experiences that came from following the guidance of the Spirit. While serving a mission in England in 1840, President Wilford Woodruff (1807–98), then one of the Twelve Apostles, was prompted by the Spirit to go to the south of England. Through his efforts and the efforts of others serving with him, about 2,000 people were converted in the area of Herefordshire, Worcester, and Gloucester. Reflecting on this extraordinary period of his life, President Woodruff wrote: “The whole history of this Herefordshire mission shows the importance of listening to the still small voice of God and the revelations of the Holy Ghost. The Lord had a people there prepared for the Gospel. They were praying for light and truth, and the Lord sent me to them” ( Teachings of Presidents of the Church: Wilford Woodruff , 91). To read about inspired dreams being a form of revelation, see the commentary for Matthew 2:12–13, 19, 22. The pronouns we and us that appear in Acts, beginning in Acts 16:10, indicate that this part of Luke’s record is an eyewitness account. It is likely that at or near Troas, Luke joined Paul and the other missionaries. This would explain how Luke knew many details of Paul’s ministry and why he focused so much of his record on Paul. Perhaps one reason why Paul and Silas were led by the Spirit to Troas was so that Luke might join them. While Paul and his companions were ministering in Philippi, they met a woman named Lydia from Thyatira, a city that was famous for its purple textiles. The best natural purple dye was extracted from the shells of mollusks, and the process was very expensive. Therefore in ancient times, the color purple became associated with royalty or saintliness. Lydia worked as a dyer and seller of purple cloth. She has the distinction of being Paul’s first known European convert and also the first person mentioned by name who joined the Church as a result of Paul’s second mission. She appears to have been a wealthy woman who owned her own house and had servants, who were part of “her household” (see Acts 16:12–15). Later, believers gathered at her home for worship and instruction (see Acts 16:15, 40). While still in Philippi, Paul and his companions encountered a damsel with “a spirit of divination” (see Acts 16:16–18). Divination is the act of foretelling, or pretending to foretell, the future by using occult practices. Divination, which is also called soothsaying, was and is forbidden to the Lord’s people (see Deuteronomy 18:9–14; Joshua 13:22). The evil spirit in the damsel bore witness of the divine mission of Paul and his companions, but they rebuked the spirit and cast it out of the young woman. The scriptures also record instances when evil spirits bore witness of the divinity of the Savior and His disciples but were rebuked (see the commentary for Mark 8:30). Elder Bruce R. McConkie (1915–85) of the Quorum of the Twelve Apostles explained why the Lord and His servants reject the testimony of evil spirits: “The testimony of the devil-led damsel was true. Paul and Silas were prophets; they had the words and power of salvation. But true testimony from Satan’s servants does not lead to salvation. In effect the damsel was saying: ‘Go ahead and believe in Paul and Silas and this Jesus whom they preach. I agree they and their Master are of God; and since we are now united on that point, you can also continue to follow me and enjoy the fruits of my divination.’ And how many other practitioners of false religions there are who give lip service to Jesus and his doctrines so that people will the more readily follow them and their special brand of ‘saving’ grace. It was for the very reason here involved that Jesus himself forbade the devils whom he cast out to testify that he was the Son of God (Luke 4:41. )” ( Doctrinal New Testament Commentary, 3 vols. [1965–73], 2:149). The deliverance of Paul and Silas from prison by an earthquake is the third account in Acts of a miraculous deliverance from prison and is part of a theme in Acts showing that Paul, like the Apostle Peter, was a recipient of the Lord’s intervention (compare Acts 5:18–20; 12:3–11). For other scriptural accounts of God delivering His servants from prison, see Alma 14:25–29 and Helaman 5:27–50. When one considers the complete scriptural record of Paul’s teachings, it is clear that his statement to the keeper of the prison is not a complete explanation of what is required of a disciple of Jesus Christ (see Acts 16:30–31). This is implied by the fact that Paul continued to teach the jailer and his household (see Acts 16:32) and then baptized them (see Acts 16:33). Clearly, being instructed and baptized were inseparably connected with believing in Christ (see also Acts 2:37–38; 19:1–6; Galatians 3:26–27; commentary for Romans 10:4–13). On the morning after Paul and Silas were miraculously released from prison, the magistrates sent a message that the men should be allowed to depart in peace. But Paul said that he and Silas would not depart quietly, for they were Roman citizens and had been beaten without first receiving a trial, which was contrary to Roman law. The magistrates feared when they heard these things. However, the way Paul dealt with being beaten, imprisoned, and put in stocks may have benefited the Church in Philippi. It is likely that following Paul’s mistreatment, embarrassed Roman officials took care not to mistreat Church members. The branch of the Church in Philippi grew to become one of the strongest branches of the early Church, one for which Paul had particular affection (see Philippians 1:3–11; 4:1). Paul and his companions entered a synagogue in Thessalonica and “reasoned with [the Jews] out of the scriptures” (Acts 17:2), providing an example for all gospel teachers to follow. He alleged that Christ had died and risen from the dead (see Acts 17:3). The archaic meaning of allege is to bring forth proof, to assert, or to declare. Paul referred to scriptural passages to declare, or to provide proof, that Jesus was the Messiah. For insights on Jewish-Christian understanding that the Messiah (Christ) had to suffer and die, see the commentaries for Mark 8:27–32 and for Luke 24:13–35. Paul left Thessalonica because he was being persecuted by the Jews. He later sent letters back to Thessalonica that became known as 1 and 2 Thessalonians. To read more about the background of these epistles, see the “Introduction to the First Epistle of Paul the Apostle to the Thessalonians” in chapter 46. After being persecuted by unbelieving Jews in Thessalonica, Paul and his companions traveled to Berea, where they taught in the synagogue and found the Jews “more noble than those in Thessalonica” because they received the word with “readiness of mind, and searched the scriptures daily” to determine if Paul’s teachings were true. President Howard W. Hunter (1907–95) discussed how daily scripture study can lead to greater spiritual understanding: “It is certain that one who studies the scriptures every day accomplishes far more than one who devotes considerable time one day and then lets days go by before continuing. Not only should we study each day, but there should be a regular time set aside when we can concentrate without interference. … It would be ideal if an hour could be spent each day; but if that much cannot be had, a half hour on a regular basis would result in substantial accomplishment. A quarter of an hour is little time, but it is surprising how much enlightenment and knowledge can be acquired in a subject so meaningful” (“Reading the Scriptures,” Ensign, Nov. 1979, 64). Athens, the capital of Greece, was one of the wonders of the ancient world. Although in a state of decline by the time of Paul’s visit, Athens had formerly possessed more intellectual genius, philosophical wisdom, and architectural splendor than any other ancient city. Its inhabitants, even during the period of decline, prided themselves on their brilliant heritage. The Areopagus (Hill of Ares), an outcropping of rock about 377 feet (115 meters) in height. Some Bible translations refer to this as Mars Hill since the Greek god of war, Ares, was equated with the Roman god Mars. Some people have called the city of Athens at the time of Paul’s visit the world capital of idolatry. Paul’s spirit was stirred when he arrived, for he saw the city “wholly given to idolatry” (Acts 17:16). Many Greeks were polytheists (believing in many gods). The chief men of Athens gathered in the marketplace each day to hear debates, to conduct business, and to learn something new. Since Paul’s message was new, he attracted listeners. At length, Paul was conducted to the famed “Mars’ hill” to appear before the chief judicial council (the Areopagus), to explain the “new doctrine” he taught (see Acts 17:19–21). Paul’s sermon addressed God’s true nature, man’s responsibility to God, and the Resurrection of Jesus Christ. Paul did not recite Jewish history or scripture as he typically did when teaching Jewish and God-fearing audiences (see Acts 13:16–41). Instead, he taught the Athenians by establishing areas of common ground and trying to lead his hearers from those points to true points of doctrine that were contrary to tenets of Greek philosophies and religions. Ruins of the Erechtheion, a Greek temple built in the late fifth century B.C. on the Acropolis in Athens. Paul would have seen this and many similar temples and religious shrines in Athens. In Athens, Paul encountered philosophers of the Epicureans and Stoics (see Acts 17:18). Epicureanism was named for Epicurus (341–270 B.C.). According to his philosophy, the world came into existence by chance and was without purpose or design. Epicureans believed that the gods, if they did exist, did not involve themselves in the lives of humans and that happiness was to be found in the absence of cares and pain and the enjoyment of pleasures in moderation. Stoicism began with the teachings of a man named Zeno (333–264 B.C.). Stoicism held that all things were created, ordered, and set in motion by divine reason. Stoics believed that man was endowed with a spark of reason and should seek harmony with the divine order of things, overcome passions, and live a moral and upright life. Like ancient Athenians, many people today seek to continually learn and to talk about “new things.” Elder Kevin R. Duncan of the Seventy observed that in our day, when information and advice from many sources is widely available, we should remember to seek answers to our problems in what the Lord has revealed through His prophets: “This world is full of so many self-help books, so many self-proclaimed experts, so many theorists, educators, and philosophers who have advice and counsel to give on any and all subjects. With technology today, information on a myriad of subjects is available with the click of a keystroke. It is easy to get caught in the trap of looking to the ‘arm of flesh’ [D&C 1:19] for advice on everything from how to raise children to how to find happiness. While some information has merit, as members of the Church we have access to the source of pure truth, even God Himself. We would do well to search out answers to our problems and questions by investigating what the Lord has revealed through His prophets” (“Our Very Survival,” Ensign or Liahona, Nov. 2010, 35). Paul complimented the Athenians, acknowledging that they were “too superstitious,” meaning they were “most religious; i.e., careful in divine things” (Acts 17:22, footnote a). The altar built by the Athenians to the “unknown god” (verse 23) is referred to in other historical sources as an altar to the unknowable god or to all gods not specifically known by name. The Athenians had apparently built this altar to avoid offending or neglecting some unknown deity. Paul referred to this altar as he began teaching that God can indeed be known by His children. “Him declare I unto you,” Paul said, and then he taught the Athenians some of what is known of God (verse 23). Paul taught that God “made the world and all things therein” and that He “dwelleth not in temples made with hands” (Acts 17:24; see also Acts 7:48–50). Elder Bruce R. McConkie explained, “The great Creator, by whom all things are, dwelleth not in temples made by the hands of his creatures; but he is worshiped by them in his temples, which holy houses he visits occasionally, and in which sacred spots his Spirit may always be found by the faithful” ( Doctrinal New Testament Commentary, 2:76). What truths about God do you find in these verses? How have these truths helped you to have faith in God? How have these truths affected the way you choose to live your life? Paul taught the Athenians that God “hath made of one blood all nations of men,” meaning that all people are God’s children. President Joseph Fielding Smith (1876–1972) taught that Paul’s words in Acts 17:26, as well as Moses’s teachings in Deuteronomy 32:7–8, “clearly indicate that the numbers of the children of Israel were known and the bounds of their habitation fixed, in the days of old when the Lord divided to the nations their inheritance. We conclude, therefore, that there must have been a division of the spirits of men in the spiritual world, and those who were appointed to be the children of Israel were separated and prepared for a special inheritance” ( Doctrines of Salvation, comp. Bruce R. McConkie, 3 vols. [1954–56], 1:59). In his famous address on Mars Hill, Paul quoted from the Phaenomena, a work by Aratus, a Cilician poet: “As certain also of your own poets have said, For we are also his offspring” (Acts 17:28). Nearly identical words occur in the “Hymn to Zeus” written by the earlier poet Cleanthes. Both Aratus and Cleanthes were Stoics. In citing these poets, Paul was establishing beliefs that he had in common with his listeners and attempting to persuade them by citing sources they considered authoritative (compare Alma 18:24–32). Paul taught the Athenians that we are all “the offspring of God” (Acts 17:29). President Thomas S. Monson (1927–2018) clarified the doctrine taught in Acts 17:29: “The Apostle Paul told the Athenians on Mars’ Hill that ‘we are the offspring of God’ [Acts 17:29]. Since we know that our physical bodies are the offspring of our mortal parents, we must probe for the meaning of Paul’s statement. The Lord has declared that ‘the spirit and the body are the soul of man’ [D&C 88:15]. Thus it is the spirit which is the offspring of God. The writer of Hebrews refers to Him as ‘the Father of spirits’ [Hebrews 12:9]” (“The Race of Life,” Ensign or Liahona, May 2012, 91). “The Family: A Proclamation to the World” also teaches this important doctrine: “All human beings﻿—male and female﻿—are created in the image of God. Each is a beloved spirit son or daughter of heavenly parents, and, as such, each has a divine nature and destiny” ( Ensign or Liahona, Nov. 2010, 129). “We have our agency, and we can choose any characteristic to define us. But we need to know that when we choose to define ourselves or to present ourselves by some characteristic that is temporary or trivial in eternal terms, we de-emphasize what is most important about us, and we overemphasize what is relatively unimportant. This can lead us down the wrong path and hinder our eternal progress” (“Be Wise” [devotional address given at Brigham Young University–Idaho, Nov. 7, 2006], byui.edu/presentations). After Paul finished his address on Mars Hill, some Greeks mocked his teaching about the resurrection of the dead (see Acts 17:32). During the first century A.D., popular Greek philosophy held that the physical body was part of what made the soul of man impure. According to Platonic dualism, the soul of man was imprisoned in a body of flesh. Hence, the teaching that Jesus Christ had a resurrected physical body would have seemed foolish to many Greeks (see 1 Corinthians 1:23) because they believed God to be pure and perfect. They might ask, “Why would a god receive back the limitations of a physical body?” Also, Plato’s idea of divine impassibility (God’s inability to suffer or feel pain) would make it difficult for many Greeks to accept Jesus as God’s Son, one who came to earth in a corruptible body that was subject to sickness, disease, and death and who lived as a servant to mankind. Dionysius was one of those who believed Paul’s teaching (see Acts 17:34). He was called “the Areopagite,” probably meaning that he was a member of the Areopagus, the judicial council that met at Mars Hill. According to tradition, he became a bishop in the Church in Athens. In later years a church named after Dionysius was built on the north slope of the hill, remains of which can be seen today. Paul traveled to Corinth, where he worked in his trade as a tentmaker to support himself. He may have worked in his trade in other cities in order to avoid being a burden on the Saints he served (see Acts 20:33–34; 1 Corinthians 9:13–18; 2 Corinthians 11:9; 2 Thessalonians 3:7–10). Elder Bruce R. McConkie noted, “Jesus was a carpenter, Peter a fisherman, Matthew a tax collector; Brigham Young was a carpenter, painter, and glazier, Heber J. Grant a businessman, David O. McKay a teacher; Paul and Aquila were tentmakers. … Work is honorable, indeed is an essential part of one’s mortal probation” ( Doctrinal New Testament Commentary, 2:163). When the Jews in the synagogue in Corinth rejected his teaching, Paul shook his raiment and declared, “Your blood be upon your own heads; I am clean” (Acts 18:6). In so doing, he was following the Israelite custom of enacting his blamelessness from the sins of those he taught. The Book of Mormon alludes to this practice (see 2 Nephi 9:44; Jacob 1:19; Mosiah 2:27). When Paul declared, “I will go unto the Gentiles,” he was stating that the Jews would no longer be his top priority in teaching the gospel (Acts 18:6). The name Gallio (ΓΑΛΛΙΩ) can be seen in the center of the fourth line of this ancient inscription. Paul was accused before the Roman official Gallio. This inscription establishes that Gallio served in Corinth in A.D. 51–52. It is one of the most valuable historical artifacts for determining the dates of Paul’s missions and epistles. Paul ministered in Corinth for 18 months. Many of the Corinthians accepted the gospel, fulfilling the promise of the Lord recorded in Acts 18:9–10. During his time in Corinth, a group of Jews tried to stop Paul’s preaching by accusing him of wrongdoing before the Roman official Gallio, “the deputy of Achaia” (see Acts 18:12–17). Gallio told them that their accusations against Paul were not matters to concern him and “drave them from the judgment seat.” Paul continued his ministry in Corinth for some time, and his departure from that city marked the end of his second mission. Paul’s third missionary journey, recorded in Acts 18:23–21:15, was the longest of his missions, both in terms of duration (three and a half to four years, about A.D. 54–58) and in distance covered (over 3,500 miles or 5,600 kilometers). Paul visited congregations he had established in his first two journeys, and spent three years at Ephesus, a location he had not previously visited (see Acts 19:10; 20:31). The account of Paul’s third mission portrays his growing influence and effectiveness as a theologian, preacher, writer, and faithful servant of Jesus Christ. During this mission Paul wrote 1 and 2 Corinthians, Romans, and perhaps others of his epistles. During Paul’s second mission he had spread word of the need to make a collection for the poor in Jerusalem. One of his prime concerns on his third journey was to collect these donated funds. The Prophet Joseph Smith (1805–44) offered the following help in understanding Paul’s experience in Ephesus, as recorded in Acts 19:1–6: “Baptism was the essential point on which [the disciples] could receive the gift of the Holy Ghost. It seems … that some sectarian Jew had been baptizing like John, but had forgotten to inform them that there was one to follow by the name of Jesus Christ, to baptize with fire and the Holy Ghost:﻿—which showed these converts that their first baptism was illegal, and when they heard this they were gladly baptized, and after hands were laid on them, they received the gifts, according to promise, and spake with tongues and prophesied” (“Baptism,” editorial published in Times and Seasons, Sept. 1, 1842, 904; spelling modernized; Joseph Smith was the editor of the periodical). Acts 19:11–12 records remarkable miracles of healing that were wrought by God through Paul. Items that Paul had handled were taken to the sick, and they were healed. (See Acts 5:14–16 for the account of similar healings.) Elder Bruce R. McConkie taught: “Healings come by the power of faith; there is no healing virtue or power in any item of clothing or other object, whether owned by Paul or Jesus or anyone. But rites and objects may be used to help increase faith” ( Doctrinal New Testament Commentary, 2:169). The people in Ephesus had sufficient faith in the Lord Jesus Christ that they were healed when Paul’s handkerchiefs or aprons were brought to them. In our day, the ordinance of anointing the sick with consecrated oil helps to increase the faith of those involved and helps them call upon God’s power and mercy. Latter-day Saint history contains a similar experience from the life of the Prophet Joseph Smith. A miraculous healing occurred on July 22, 1839, after the Prophet had healed many individuals near the small town of Montrose, Iowa, and was waiting for a boat to take him home. President Wilford Woodruff recalled: “While waiting for the ferry-boat, a man of the world, knowing of the miracles which had been performed, came to [Joseph Smith] and asked him if he would not go and heal two twin children of his, about five months old, who were both lying sick nigh unto death. They were some two miles from Montrose. The Prophet said he could not go; but, after pausing some time, he said he would send some one to heal them; and he turned to me and said: ‘You go with the man and heal his children.’ He took a red silk handkerchief out of his pocket and gave it to me, and told me to wipe their faces with the handkerchief when I administered to them, and they should be healed. … I went with the man, and did as the Prophet commanded me, and the children were healed” (Wilford Woodruff, Leaves from My Journal , 65). False priests, who were sons of the chief priest in Ephesus, attempted to cast an evil spirit out of a man. The evil spirit answered and said, “Jesus I know, and Paul I know; but who are ye?” (Acts 19:15). The man with the evil spirit then attacked the false priests and overcame them. This experience teaches the principle that unembodied spirits who follow Satan recognize priesthood authority. Elder Bruce R. McConkie said of false priests: “In imitation of the true order whereby devils are cast out of people, false ministers (having no actual priesthood power) attempt to cast them out by exorcism. This ungodly practice was probably more common anciently than it is now, because few people today believe either in miracles or in the casting out of literal devils. But over the years it has not been uncommon for so-called priests to attempt to expel evil spirits from persons or drive them away from particular locations by incantations, conjuration, or adjuration” ( Mormon Doctrine, 2nd ed. , 259). Paul’s success in bringing people to Christ’s Church negatively affected the economy of Ephesus, which relied upon income from visitors to the Temple of Artemis. Artemis was the Greek name for the Roman goddess Diana, and the temple built to her in Ephesus was one of the seven wonders of the ancient world. It drew pilgrims from all over the empire, as well as local merchants who earned their living selling temple visitors food, lodging, dedicatory offerings, and souvenirs. Craftsmen who made and sold images of the goddess provoked a public uprising against Paul and his message. A large crowd gathered in the theater at Ephesus, which could hold 24,000 people, and chanted for two hours, “Great is Diana of the Ephesians” (see Acts 19:23–34). Paul wanted to address the crowd, but he was dissuaded by Church members and government authorities who were concerned for his safety (see Acts 19:30–31). Shortly thereafter, Paul left the city, traveling through Greece and Macedonia and strengthening Church members. Acts 20:7–12 records that Paul participated in the ordinance of the sacrament with other Christians. In celebration of the Resurrection of Jesus Christ, Christians partook of the sacrament on the first day of the week (see verse 7; see also John 20:1). This same pattern is followed in the Church today. While Paul was preaching to the assembled disciples, a young man named Eutychus was accidentally killed, and Paul’s exercise of priesthood power restored him to life. With the raising of Eutychus from death, Paul joined with others who exercised this priesthood power﻿—men like the Savior, Peter, Elijah, and Elisha. Paul’s farewell to Church leaders from Ephesus is filled with tenderness and strength of testimony. He spoke of his service among them and the conviction the Spirit gave him that he would not see them again, for he knew that his return to Jerusalem would put his life in danger. Paul’s words in Acts 20:22–26 are reminiscent of similar words spoken by the Prophet Joseph Smith shortly before his Martyrdom: “I am going like a lamb to the slaughter; but I am calm as a summer’s morning; I have a conscience void of offense towards God, and towards all men” (D&C 135:4). What admonition did Paul give to Church leaders in this verse? How have you seen bishops or branch presidents follow this counsel? How do these leaders help to protect Church members against evil? Knowing of the Apostasy that would soon begin among the Ephesian Saints, Paul admonished Church leaders to “feed the church of God” (Acts 20:28). One of the most important ways Church leaders do this is by nourishing members with the “good word of God” (Moroni 6:4; Alma 31:5). To be nourished by the word of God is one of the greatest protections against apostasy. Elder Jeffrey R. Holland of the Quorum of the Twelve Apostles expressed how Church members seek spiritual nourishment today: “Most people don’t come to church looking merely for a few new gospel facts or to see old friends, though all of that is important. They come seeking a spiritual experience. They want peace. They want their faith fortified and their hope renewed. They want, in short, to be nourished by the good word of God, to be strengthened by the powers of heaven. Those of us who are called upon to speak or teach or lead have an obligation to help provide that, as best we possibly can” (“A Teacher Come from God,” Ensign, May 1998, 26; see also commentary for John 21:15–17). As he bade farewell to the Church leaders in Ephesus, Paul warned them that an apostasy was coming and that it would be the result of forces working both outside the Church (“grievous wolves”) and inside the Church (“of your own selves”) (Acts 20:29–30). The Greek word apostasia, which was translated as “falling away” in 2 Thessalonians 2:3, is closer in meaning to “rebellion” or “revolution.” Thus, Church members themselves contributed to the Great Apostasy by rebelling against Church leaders and doctrine (see the commentary for 2 Thessalonians 2:3). Priestcraft was an important element of this internal rebellion. Paul’s words in Acts 20:30 provide a definition of priestcraft (see also 2 Nephi 26:29). Elder James E. Talmage (1862–1933) of the Quorum of the Twelve Apostles affirmed Paul’s message: “Not only would outsiders ingratiate themselves with the saints for purposes of selfish gain﻿—wolves entering in, and not sparing the flock,﻿—but schisms and divisions were imminent; and these dissensions were to come through some then present﻿—men who would aspire to leadership, and who would set up their own doctrines, thus drawing disciples away from the Church and unto themselves” ( The Great Apostasy , 28). Discussing the origins of the Great Apostasy, President Joseph Fielding Smith declared that some of it was the result of evil men who moved in and displaced the authority of the Apostles: “In time all ordinances of the gospel were changed, commandments were broken, and the simple principles of the gospel were mixed with pagan philosophy by the ‘grievous wolves’ and apostate disciples who displaced the prophets and apostles who had divine communion with the heavens. Spiritual darkness set in, and unrighteous men took command and closed the heavens against themselves. Visions and contact with the heavens ceased, and the gifts of the spirit came to an end. The blessings and presence of the Twelve Apostles ceased, and the cry went forth that they were no longer needed” ( Answers to Gospel Questions, 5 vols. [1957–66], 5:177). As Saints throughout the world provide service to others, they follow the Savior’s admonition, “It is more blessed to give than to receive” (Acts 20:35). In this photo, two young women from Korea fill bags with hygiene items for those in disaster areas throughout the world. “None of us will forget that gray morning when our beloved teacher announced to us that the mother of one of our classmates had passed away. We thought of our own mothers and how much they meant to us. We felt sincere sorrow for Billy Devenport in his great loss. “The lesson this Sunday was from the book of Acts, chapter 20, verse 35: ‘Remember the words of the Lord Jesus, how he said, It is more blessed to give than to receive.’ At the conclusion of the presentation of a well-prepared lesson, Lucy Gertsch commented on the economic situation of Billy’s family. These were Depression times, and money was scarce. With a twinkle in her eyes, she asked: ‘How would you like to follow this teaching of our Lord? How would you feel about taking our party fund and, as a class, giving it to the Devenports as an expression of our love?’ The decision was unanimous. We counted so carefully each penny and placed the total sum in a large envelope. A beautiful card was purchased and inscribed with our names. “This simple act of kindness welded us together as one. We learned through our own experience that it is indeed more blessed to give than to receive” (“Your Personal Influence,” Ensign or Liahona, May 2004, 21–22). Consider the ways in which Paul was an effective missionary. What can you do to become better at sharing the gospel? How can you be a better friend to those who are investigating the Church? Paul used the scriptures to teach of the Atonement of Jesus Christ (see Acts 17:2–3). What scriptures would you use to teach someone about the Savior’s Atonement? Read Acts 16:6–10; 18:9–11. Write a paragraph explaining the ways the Holy Ghost directed Paul and his companions during their journey. Write a second paragraph describing how the Spirit has directed your efforts to share the gospel. Be sure to include at least one thing you could do to receive more of the Spirit’s guidance in your life. Read Acts 17:24–31, and write a series of statements that summarize what Paul taught the Athenians about the true nature of God. Write a short explanation of the difference between believing that we are God’s offspring and believing that we are merely His creations.